Grandmothers that Are Like Mothers, What would We do Without them? Dedicated to the Mothers and Grand mothers from HP, You know who You Are!! Pulsing the Hubs. We’ve seen real grandmas commenting. Even though they might be busy, they come to join us. Take the case of Faith Reaper…. she is babysitting this weekend, but takes her time to be with us. Debbie brooks uploading her pictures to FB, before publishing her next installment, she makes sure she calls to check on her grand-kids. And sometimes she gets surprises, “Mom, my wife is pregnant again,” says her son. So life keeps its cycle, and we watch with joy on a virtual screen of life. Just look at our friend Becky Katz: busy as she can be. 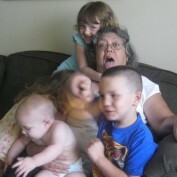 A Grandmother told me… I thought I was spoiling my kids, but my grand children? Oh my goodness… don’t get me started! The love from a grandmother becomes double reward on a reciprocal level. Just to let you know guys that this is being written from pure inspiration (angels? muses? God?). So whatever you read as follows is not even thought of… until we just keep on writing. Amazing huh? Grand mothers are really a blessing for everyone. From words like More.. Grandmothers that Are Like Mothers, What would We do Without them?